At least four large-scale international military exercises with at least 500 foreign military personnel will be held in Latvia this year, LETA found out from the Defense Ministry. From April 17 to 30 the Summer Shield XIV military exercise will take place in Latvia. Participating in this international ground and forces exercise will be soldiers from Latvia, the United States, Canada, Lithuania, Estonia, Luxembourg, Slovakia, Romania, Bulgaria and Sweden. The aim is to integrate and coordinate fire support during infantry operations using artillery, aviation, and engineer support. The exercise will help improve cooperation between NATO member states. Over 500 foreign military personnel will participate in the exercise. From June 3 to 16 the Saber Strike international military exercises will be held in Latvia. Participating in this air and ground forces exercise will be soldiers from Latvia, the United States, Canada, Great Britain, Italy, Lithuania, Norway, Poland and Slovakia. Over 500 foreign military personnel will participate in this exercise as well. Also this summer, the annual Open Spirit international naval exercise, aimed at locating and liquidating explosive devices from WWI and WWII in the Baltic Sea, will he held. In the fall, the annual multinational ground forces exercise Sudraba Bulta (Silver Arrow) will take place. 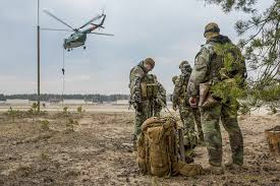 Several other military exercises with less than 500 foreign military personnel will also be organized in Latvia this year, including the Baltron Squadex naval exercise in April, as well as the Baltic Bikini naval search and rescue exercise in the summer. The NATO-led Steadfast Pinnacle/Steadfast Pyramid will be held in the autumn, while the explosives and munitions neutralization exercises Detonators will also be held in the autumn. The aim of the exercises is to improve regional stability and security, as well as improve the coordination between NATO allies.